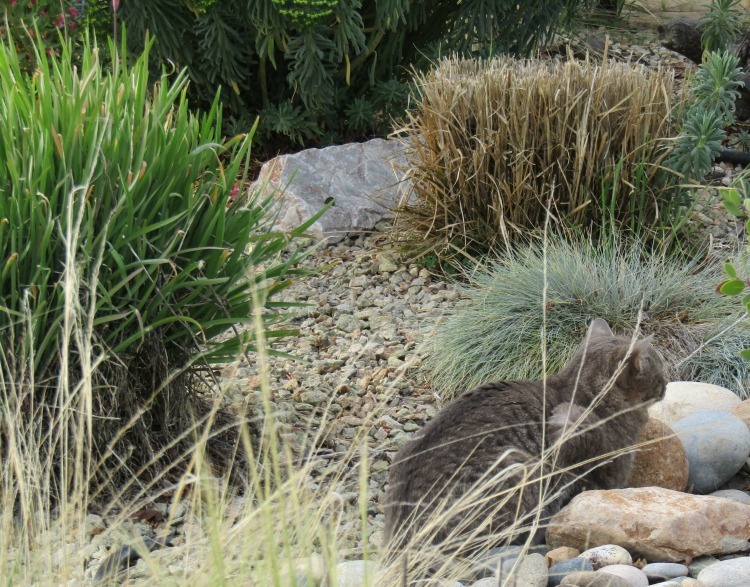 As I was walking around my neighborhood this afternoon, I almost missed this very still cat crouching in the rocks in this xeriscaped yard. She appeared to be hunting and waiting patiently for some prey to come out. I'm guessing she may have been waiting for a lizard, since I've seen a lot of cats hunt them, but she also may have heard a rodent. The cat was alert, not asleep. She was very patient. She didn't move during the ten-fifteen minutes I was taking photos of the yard. 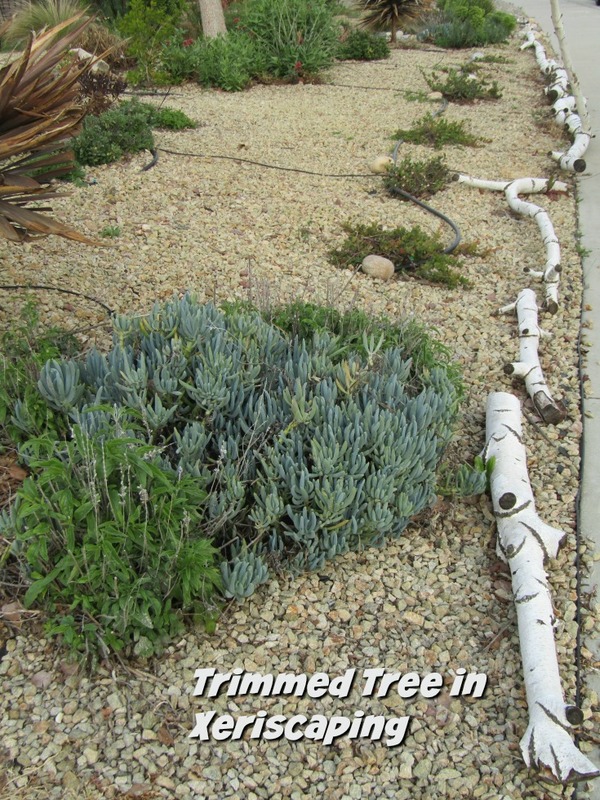 Xeriscaping is landscaping that is designed to use very little water. 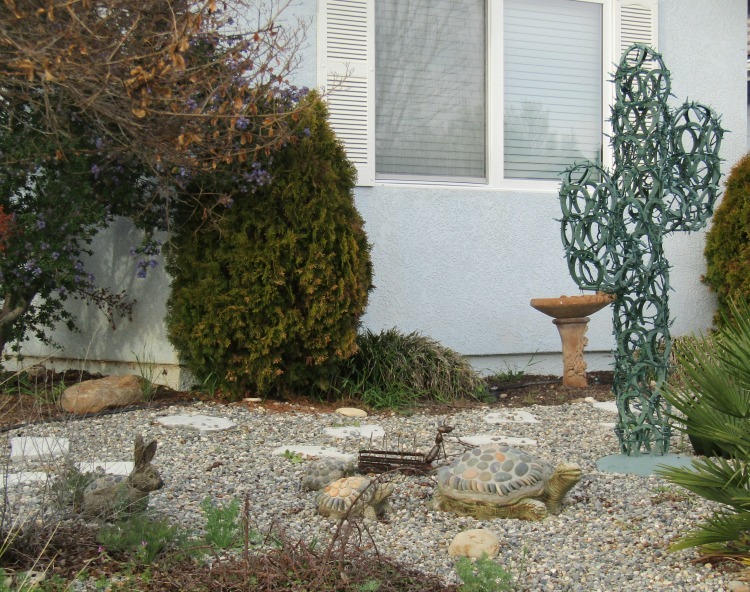 It depends upon drought-resistant plants, drip irrigation, mulch, and decorative art to make it beautiful. You can see all these things in this yard. 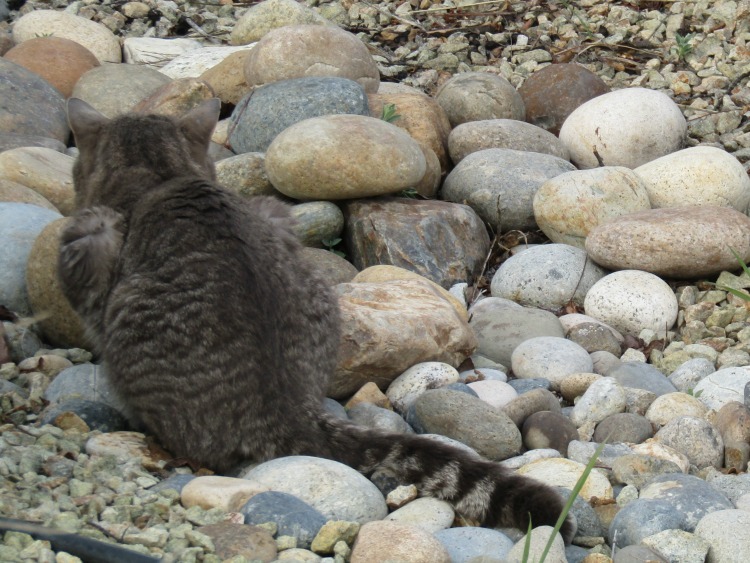 The cat I introduced above lives here, and if you look very carefully, you might see her lurking behind the rocks. But you need very sharp eyes. 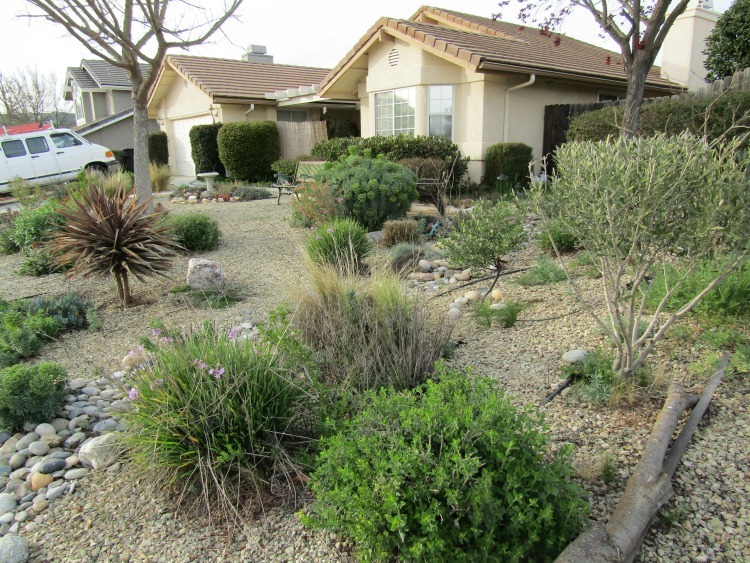 Notice the rock mulch, drip irrigation, and drought-resistant plants used in the design. The benches are there so the owners can enjoy the garden. The cats also seem to enjoy roaming here. 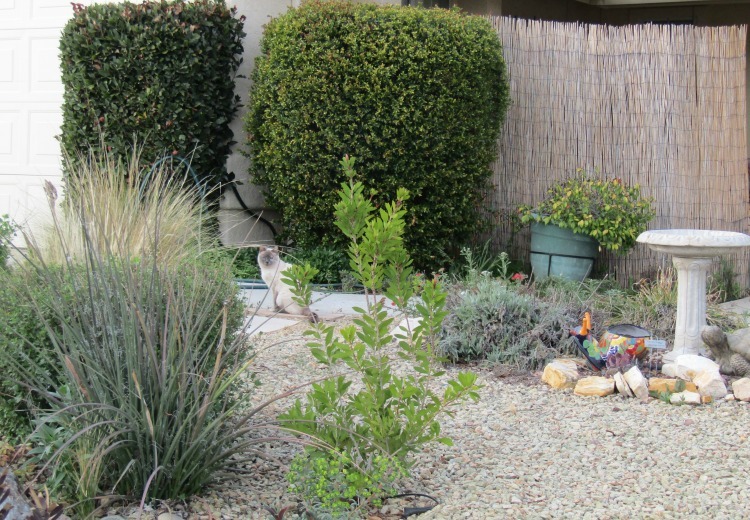 Below is a closer look at the plants around the tabby cat. The homeowner next door also made good use of yard art. I thought his cactus sculpture was clever. The tortoises, ant and bunny also caught my attention. Here's a closer look at the ant and the tortoises. The sculptures above matched the coloring of the rocks pretty well and blended nicely with the plants. They didn't try to steal the show. The art below grabs a bit more attention. The snail is brightly colored. It appears to be a planter. 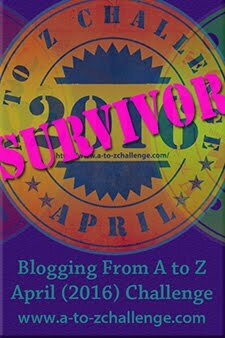 I will show you a closer look at it tomorrow. That Siamese cat you see on the walkway in the background will star in tomorrow's post. Stay tuned. This last photo shows the edge of the property near the sidewalk. You can see how the branches of a tree which I'm assuming the homeowner removed or trimmed features prominently as a border. 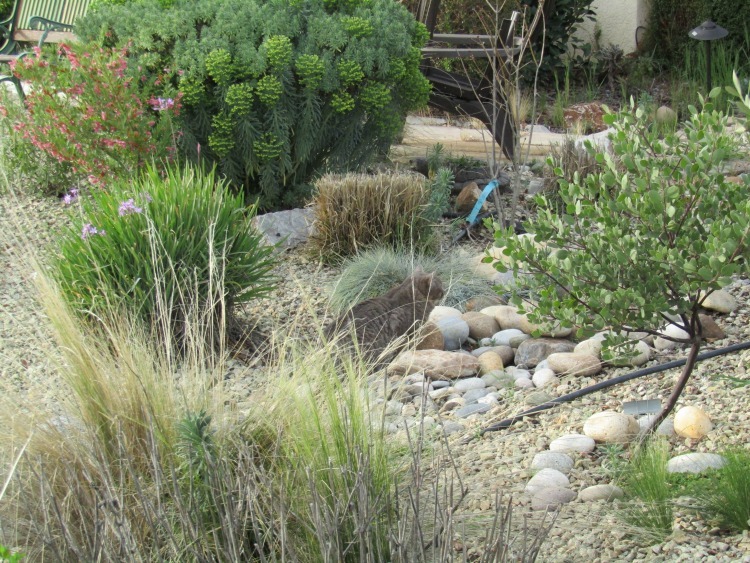 Did you get any xeriscaping ideas from these photos? Get more ideas from my gardening blog, Barb's Garden Observations.